What hath Mrs. O'Leary's cow wrought? What hath Mrs. O’Leary’s cow wrought? The panic produced in financial and commercial circles by the Chicago fire has subsided; but the real magnitude of the calamity begins only now to be measured. The loss is evidently much less in amount than the first exaggerated estimates, but the character of the loss is widely different from what is generally believed. The first effect was the more or less compulsory sale of securities to provide the means of meeting actual losses. It was this sale, and its anticipated effect upon the markets, that created the terrible depression in securities of last week from which Wall Street has not yet recovered. The more serious effect is that which results from the withdrawal of funds from New York to enable the banks, merchants, and people of Chicago to repair their losses. The banks, in order to respond to this drain, even to the limited extent so far experienced, were obliged already last week to draw their reserves down below the limit prescribed by law, and the drain has been more severe the present week than it was last. It is from this source that the real danger threatens. The actual loss of property, great as it is, will be speedily retrieved by the inexhaustible activity, energy, enterprise, and intelligence of the people, but the disturbance in the delicate machinery of bank credits is more difficult to rectify, and many persons are already calling upon the Secretary of the Treasury to interfere, with all the power of the United States Government, to prevent a serious curtailment of the currency of the people, and to issue a portion of his greenback reserve in place of the credits destroyed by the present uncertainty. In Wall Street, the alarm reached its height on Saturday, prices rallying sharply from the lowest points, and working, with moderate fluctuations at best, a slight level above the extreme decline. Money continues stringent, though no longer at the usurious rates artificially made in the midst of the panic by speculators for a decline. The average fall in securities is probably not much less than ten per cent. Gold has likewise fallen off, owing to the abundant supply of foreign capital offered here at the extreme rates of interest. The rates of exchange have correspondingly declined from the same reason. The fall in Government securities, which seems at first surprising, is caused by the fact that many financial companies, at the first sign of alarm, sold these securities upon which they could most speedily raise cash without great loss. All trade has received a severe blow, no one daring to enter upon important negotiations until the effect of the fire is better understood. Prices of most articles have fallen off. Produce and provisions are lower; best coffee, tea, and groceries, of which the supply is insufficient, remain firm. Real estate is in a very precarious condition. The general feeling throughout the community is one of uncertainty, but no longer of alarm. Strengthened and comforted by the magnificent benevolence of the rest of the country, Chicago has spent the week in looking on the bright side of her great calamity, in adjusting and diminishing the losses, clearing the débris, building anew, and caring for the homeless and starving. 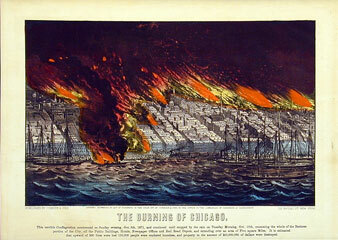 There is, happily, no disposition manifested to rely for exemption from future destruction on the exceptional conditions which invested the late fire with so much fury and awfulness; though it is difficult to see in what the safety of the city will consist so long as the Western Division and what remains of the Southern continue to be of wood. A hint as to the proper safeguard may be found in the singular preservation of Mr. Ogden’s house in the North Division, in spite of its being a frame house and shingle-roofed; apparently, because it had a public square on one side, and private grounds, of green trees and shrubs, about it on the three others. It is well-known, also, that the progress of the flames on the south was stayed by a couple of vacant lots at the end of a block. Now, if a cordon of open space were temporarily drawn all around the district to be rebuilt (from which, of course, all wooden structures will be excluded), the new city would seem to be secure against the tinder-boxes to the west and south of it. The wooden pavements do not appear to have helped the spread of the flames materially, but the plank sidewalks undoubtedly did; and, being loosely laid on trestle-work, boarded at the side, forming tunnels, with seasoned pine studding underneath, they offered the best arrangement for extending a fire that could be made at the cost. These we shall not see restored; neither, it is to be hoped, the finishing of brick and stone buildings with wooden cornices and parapets and immense wooden signs. So, too, those blocks within blocks have disappeared for ever—wooden houses set back from the broad to the narrow streets, and surrounded by solid warehouses; new Chicago displacing but encircling the old. All accounts agree that the heat of the fire was overpowering at a great distance in advance of the destroying flames, and the roar of the hurricane horrible and appalling. It was this that gave the event the character of a tropical catastrophe. Simultaneous with the burning of Chicago, still more dreadful fires, if possible, have occurred in Wisconsin and Michigan, along the shores of Lakes Michigan and Huron and Green Bay and Saginaw Bay, and even along the river valleys and in the interior of those peninsulas. Here the forest fires have destroyed whole villages at a blow, with the same violence of wind as at Chicago, and with a loss of life not only greater in the aggregate, but more overwhelming to the survivors. The only refuge was underground, or in the lake and river water, where too often death came in a double guise. The very industry of these districts, largely peopled by Belgians and Hollanders—the pinelumber manufacture—has been annihilated, together with their accumulations and stores for the coming winter, and the hardship is most distressing. Some idea of the force of the gales may be had from the experience of Peshtigo, on a river of the same name emptying into Green Bay. It had once before suffered seriously from fire, and the heart of the village, being thus removed, had never been rebuilt, so that the town had a very scattered appearance, with the houses very far apart, and the river dividing it into two distinct divisions. Menomonee was a much larger place, and its saw-mills were, perhaps, the largest in the world. The loss of life was probably largely due to panic. In both towns, however, the refuse of the mills lay piled about, and was, doubtless, after being fired, lifted and thrown about with a force sufficient to kill those who were exposed to the flying fragments.